Humanz is the fifth studio album by the British virtual band Gorillaz, whose real life members consist of Damon Albarn (Blur) and Jamie Hewlett (Tank Girl). Boy, I have been waiting for this record for a while. Gorillaz have been putting out very amazing and experimentally consistent albums, from their self-titled debut to Demon Days to Plastic Beach. We don't talk about The Fall, though. That isn't exactly the best album....(Vietnam War flashbacks) but anyways, I'll have to say that this record does not disappoint. This album is full of tracks that give off a party vibe, and each individual track has its own quirk. Ascension, which is 2nd track but really starts off the album, is song with super danceable rhythms and a melodic synth lead. The song is accompanied by Vince Staples' rapping, and his voice definitely compliments the instrumentals. Another notable track is Submission, which is a very fast paced R&B track with vocals from Kelela and rapping from Dannt Brown in the second half of the track and its super catchy vibe is certain to hook you. Now this album isn't without its problems. For starters, at a glaring 20 tracks (26 if you have the Deluxe Edition), the album feels almost disorganized, from a studio album perspective. On, say, a mixtape standard, the tracks feel appropriately placed where they are. Also, 2D (or Damon) mostly takes a backseat on this album. His vocals are mostly reduced to occasionally verses on most tracks which have features. Sometimes, he isn't even featured on tracks. The only track where he takes the spotlight is Busted and Blue, so his lack of presence may turn you off. With that being said, regardless of a few gripes, I think this is another great record in the Gorillaz's catalog and I really think you should check. 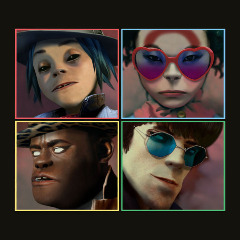 Humanz gets a 4/5. If you listened to it, what did you think? I really wanted to put out some reviews for music that I think people here on the forums would listen to. Do you want to see more of these? And if so, what do you want me to review next? I can't say I really love their new album all that much because, it's not up my alley in taste. I think just the randomness of different tunes is what throws me off. Sure! I wouldn't mind more reviews of different albums and artists! I do happen to wonder if that goes for all current and old albums? Or if you want to do only new stuff? Well, I am planning to review new stuff (like the new Logic album coming out this Friday), but I wouldn't mind some old stuff. I want to listen to Utada's new record from last year (which under the radar for me somehow), but I can't my hands on it. And besides, I'm not exactly sure what old content I can review that will actually appeal, but if I'm feeling it I will do older albums based on what I want to talk about or what people should check out.